Omron Servo Drive R7D-AP08H can be interfaced with PLC to run the Servo Motor in Controlled manner and as per our applications and need. PLC will provide pulses to Servo Drive and accordingly servo motor will run. We just have to make some hardware connection and write a suitable correct program in PLC. We will see the step by step procedure here. One thing we should keep in mind that our PLC should have pulse type output, then only it can provide pulses to the servo drive. 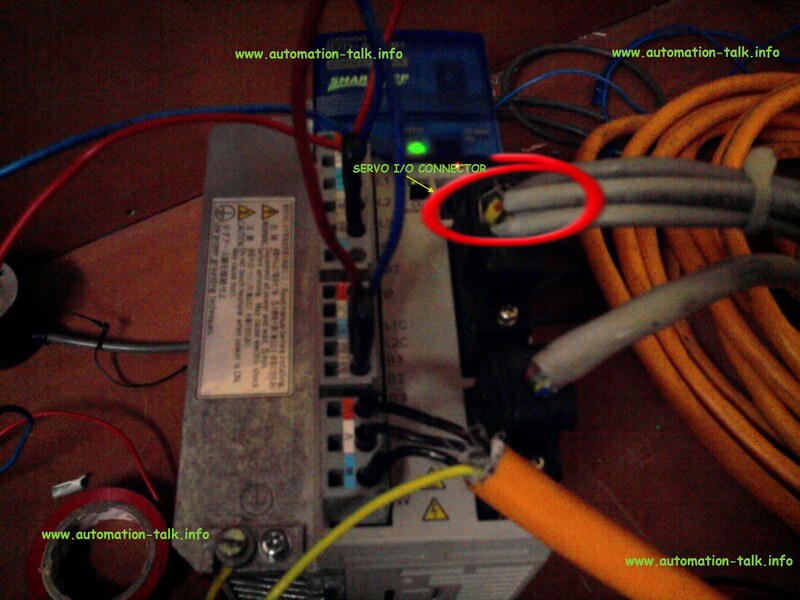 First of all, we have to make the control connections between our servo drive and PLC. If you Look at the front of servo drive then there is R7D-AD I/O connector, we have to connect some terminals of it with PLC. It is a 20 terminal connector but for our purpose, only 6 terminal connections have to be done. See below details for Interfacing of Servo Drive with PLC. Subscribe to PLC, HMI Programming and SCADA Tutorials by Email . Here we have considered the PLC as output as T1 type i.e PNP transistorized output. NOTE:- N24 V stands for 0V or negative 24 v DC. 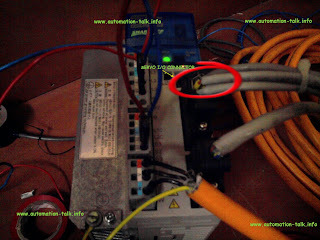 Connect the Common of PLC to P24 V.
You can see the Below picture for a better understanding. So our half part is done now we have to write the PLC program to provide the pulses to the servo drive. Here we are using output 100.0 and 100.1 as depicted above in connection diagram to give pulses to the servo drive. So we have to configure the output as pulse type in our program. We have to write PULS instruction to specify the port and a type of Pulses i.e relative or absolute and also number of Pulses. Then we have to write SPED instruction to specify the mode that is the motor should run in clockwise or anti-clock wise direction and also the frequency of pulses i.e the RPM/speed of the motor. With the Help of PULS and SPED instructions we can make any combination to run the motor as per our requirement. Generally, we have defined the number of pulses in PULS instruction, 1000 pulses are required for 1 rotation and we have to define the speed in SPED instruction. We have made a PLC Program for yours better understanding and examples of both CW and CCW is given in the PLC Program. You can download it from below link. And after doing all this still if you are facing any problem then you can write in the comments section and we will be happy to help you. Don't forget to Subscribe to get all the servo related updates in your Inbox. Subscribe to Automation-Talk by Email. How the puls and sped function will activate the output 100.00 and 100.01. I didn't see the output was wrote in your ladder. Kindly pls explain. If u see the program , then in PULS and SPED instruction it is defined that we are using Port 0 i.e 100.0 and 100.1 , If u see we have written PULS #0 .. it means these outputs only. If You need any further help , feel free to ask. Thank a lot for the information. Really help me. I also using CP1E Omron PLC as controller to drive Autonics Stepper motor. So far it works good. In case to add 1 or 2 more motor as y and z axis is it need to add expansion i/o or something? Any idea? In CP1E the number of puls output depends upon the model type , for ex 20 , 30 or 40 i/o. And yes you can use the extension module for having more pulse outputs to control more motors. If i need to control motor how to read pulse from sero drive please tell me. @Anil you can set display to monitor to see pulses. Let us know what you want to do, so that we can suggest better. your information is helping me. I am a beginner just hopping that one day I will be a master in programming plc.